Kausalyatai’s initial exposure to music was from her mother who was a student of the Mumbai branch of the Gandharva Mahavidyalaya. Her formal music training began with D. R. Nimbargi (a disciple of Antubuwa Joshi). After she got married, she went on to learn from the great Gajananbuwa Joshi for a few years. Much later she started her taleem under the legendary Mogubai Kurdikar, and learnt from her for over 40 years. She was a highly disciplined purist, uncompromising in her gharana ideologies. Her music was rooted in Mogubai’s idiom, to which she added her personal interpretations. Her gayaki was said to be gentle and delicate. Her presentations were met with great critical appreciation. She did not take up music as a profession, and hence did not give public concerts. She however performed in private mehfils, in temples and on special occasions. On the occasions that she did perform at music conferences, she did not charge any remuneration fee. She was, however, a frequent broadcaster on the AIR. Kausalyatai was a generous teacher who trained many disciples. In Manjeshwar, her hometown, she taught bhajans to many young girls who came to her; and in Mumbai and Mangalore she trained several students in raag-sangeet, the most prominent among whom is Pratima Tilak. Several foreign students have sought her guidance and advice on the subtleties of Indian raga music. During the 1940s, Kausalyatai had the honour of singing bhajans at Mahatma Gandhi’s prayer meetings in Mumbai. In 1948, she sang at the function preceding the immersion of Gandhiji’s ashes in Mumbai. 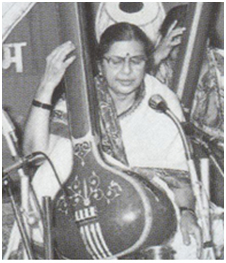 From 1953 to 1955, she spearheaded the Bharatiya Sangeet Kalakar Mandal (an organisation formed by musicians from all over the country with Vilayat Hussain Khan as the president and Kausalya Manjeshwar as the honorary joint secretary) in the agitation against the AIR for setting up a demeaning and biased policy of audition for all artists who wished to broadcast, irrespective of their stature. A settlement was reached at the end of two years, and Kausalya Manjeshwar’s contribution to the movement was monumental. This is an important event in the history of modern Indian music where the musicians were brought together for a common cause. She set to music the ‘Suprabhatam’ which is played at the Shrimad Ananteshwar Temple, Manjeshwar every morning. Kausalyatai was honoured by several organisations for her contribution to music. She was honoured with the ‘New Year’s Award’ by the Academy of General Education, Syndicate Bank and the Rotary Club of Udipi-Manipal in 1991. The ‘Saraswatabharanam’ award was bestowed on her by H. H. Srhi Sadyojat Shankarashram Swamiji of Chitrapur Math, Shirali in 2000. Her husband, Dinkar Manjeshwar, a tabla player himself and an archivist was a source of constant support and encouragement for her at every step of her journey. He also played an important role in actively helping musicians who were involved with the Bharatiya Sangeet Kalakar Mandal.